A simple installation of a quality carpet can bring a dramatic effect in your house changing the colour and also the acoustics of the property. However, the process of fitting a carpet is not as easy it may appear from searching the perfect carpet up to the fitting of the carpet. When choosing a carpet, Carpets Hertfordshire recommends you to find a carpet with very high quality underlay which is much more comfortable underfoot. Aside from that, the carpet will also last long compare to those with poor cushioning. After choosing your preferred carpet, it is now time for your carpet fitting. In order to do it perfectly and aesthetically pleasing, follow this short guide by Carpet Fitting Hertfordshire. Before you decide to lay your carpet, let us first tell you that carpet fitting can be a daunting experience for the novice. If you want to make sure, and you hate compromising the quality of the result, we recommend you to hire the service of a Carpet Fitter in Hertfordshire. On the other hand, if you are pretty confident that you can do it on your own, here is a short guide that you can follow. Using Gripper in Some Areas-It takes someone knowledgeable regarding flooring Hertfordshire in order to create a professional carpet fitting. It is important to start of with gripper, which is initially nailed to the floor. This then serves to keep the carpet stretched and held in place. To do this you place the nail near the edge of fitting gripper. Use a long bar that will hold the nails. Hit the long bar in order to keep it in place. When installing a gripper, you need to find the pipes and electrical wires first and then mark it. In places that present a danger in using nails, use adhesive instead in keeping the gripper in place. Underlay-After installing the Gripper, the underlay for the carpets should first be laid. Roll the underlay and secure it using a staple gun. Fix the rows by using a duct tape or a carpet tape that is available at Herts Carpets. Laying the Carpet- Lay first your carpet loosely. Stand on one edge of the room and start pushing the carpet using your foot. On the off chance that you need to cut the Carpets, you can do so but remember to leave an overlap on the edge. 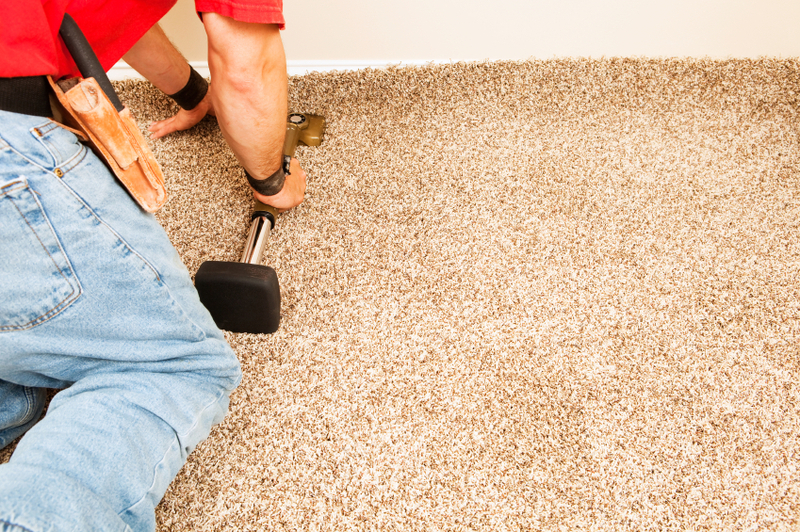 Cutting the excess- When cutting the excess, you should start by cutting the Carpets Hertfordshire in a vertical position. Start the Fitting- Look at the longer part of your room. Start fitting your Carpet on that area first by using a tucker. Using Carpet Stretcher-With the help of a carpet stretcher, the Carpets Hertfordshire can perfectly fit on the surface. By using a carpet tucker, push the excess carpet down into the gripper. In case that you find this procedure very difficult or you get stuck, you are very welcome to contact Herts Carpets, who specialise in Carpet Fitting in Hertfordshire.